Germain L, Zack DJ & al. Functional genomic screening identifies dual leucine zipper kinase as a key mediator of retinal ganglion cell death. Proceedings of the National Academy of Sciences of the United-States of America, 110(10):4045-4050, mars 2013. Scientific impact: Glaucoma is a neurodegenerative optic neuropathy in which the death of retinal ganglion cells (RGC) is responsible for the vision loss. In order to develop new treatments for glaucoma, a high-throughput RNA interference experiments were performed and Dual Leucine zipper Kinase (DLK) was therefore identified as a required signaling protein in RGC death. The importance of DLK in this process was confirmed by in vitro and in vivo studies in which RGC survival following axonal injury was increased in RGC with reduced DLK expression or those treated with tozasertib (a DLK inhibitor). In accordance with these results, an increase DLK expression was also observed in rat retinal sections following optic nerve transection. This work allowed the identification of DLK as a therapeutic target and tozasertib as a therapeutic agent to be considered for the treatment of glaucoma and perhaps of other neurodegenerative diseases. Network contribution: The Vision Health Research Network has contributed to this work through the development of a structure promoting the health vision research that support the execution of work as evidenced by this high level publication. 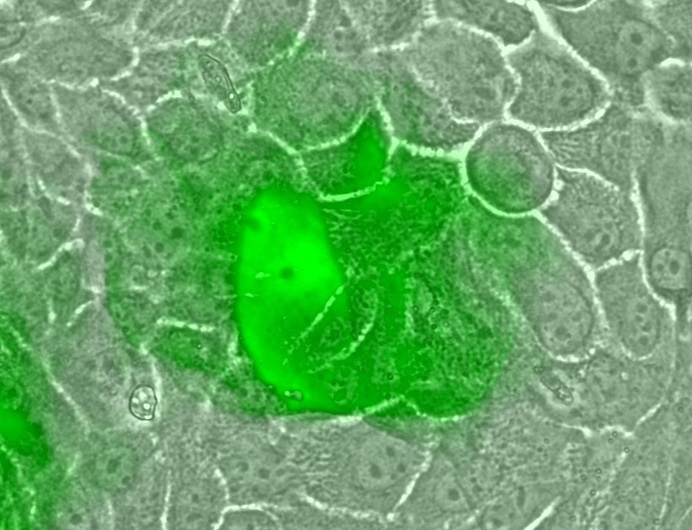 The overexpression of DLK, following a transuction by adenoviral vectors in epithelial skin cells in culture (in green), induces differentiation and cell death processes. 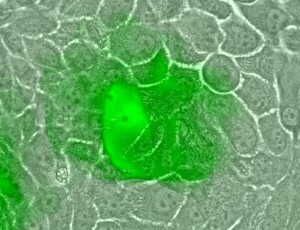 The PNAS article shows that DLK is implicated in the death of retina cells.